By sjurvetson on May 26, 2009. Gene Nowaczyk is aiming for the big prize - a successful launch to 100,000 ft. After 50 hours/week over two years, he drove his custom airframe from Missouri in a huge truck. 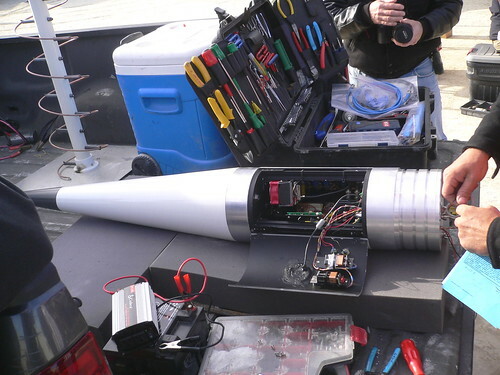 His homebrew Q motor is just huge, about 4x the total thrust of a cruise missile booster, or 64,000 Estes rocket engines, but an aged binder led to air pockets that caused a motor overpressure and rupture overhead. Success! This photo quickens my pulse. 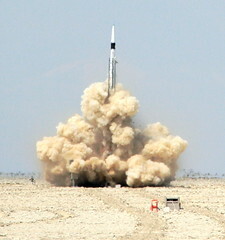 Gene rocket recorded video during its record-setting launch at BALLS in the Black Rock Desert, Nevada. This is a frame grab from the video. The readings are in meters, so this sensor indicated an altitude of ~ 100K ft. 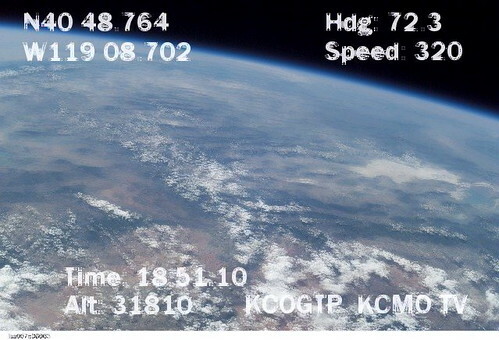 The atmosphere ends at 55K ft at this latitude. 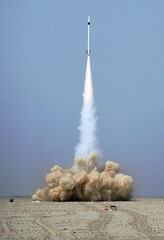 This launch was a highlight of the weekend, as celebrated on the cover of the New York Times. The nosecone is now cooling from a peak of 425Â° during the ascent. 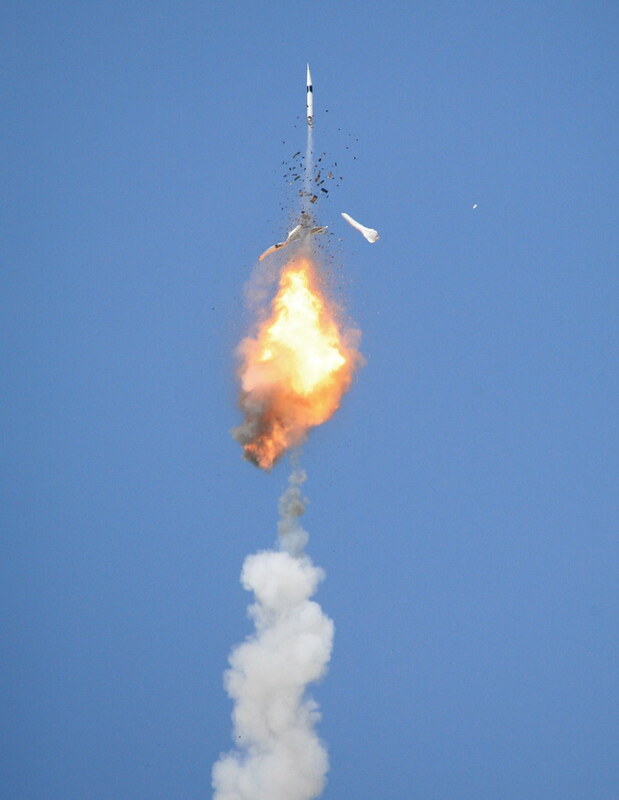 The thermal expansion and contraction of the electronic leads led to a loss of power soon after apogee. But the rocket was recovered in almost perfect shape, with just the paint burned off the nose cone. 100km is the Karman Line, the (somewhat arbitrary) boundary of the edge of space! Seems apt as you can see the thin blue line.... quite the perspective. What are the other levels of measurement? 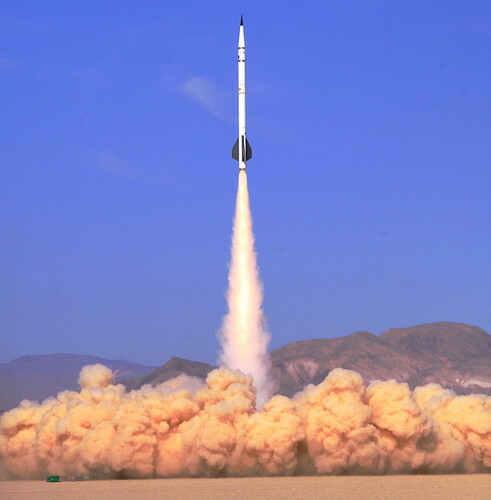 Since you give the value of mach 3.5, that indications is in meters per second? Mein Gott that is quick. The legend says it transmits telemetry to earth, do you know what frequency - band they use? The article states a over-sized satellite dish. I take it that they setting up 2/5m parabolic antennas to receive the signal. 18 Ghz? (2.4Ghz Wifi would be attenuated coming through the atmosphere) I'm assuming they must be using a licensed band that doesn't interfere with local air traffic or satellite transmissions. That's got to be difficult to track and keep the signal, fascinating stuff. Not sure on the rocket's radio band, but I can ask if you want the details.